J Cunningham’s ingenious use of primary source material, as for Ambulance Train, is in evidence again with this song, written for the 1977 Stantonbury Campus Drama Group musical documentary, All Change! Written and directed by Roy Nevitt, the play told the story of the coming of the railway to the area in the mid-19th century and the growth of the railway towns of Wolverton and New Bradwell. As Wolverton is half-way between London and Birmingham, it was here that that the LNW Railway Company built the world’s first Grand Central Station where passengers could descend during their six-hour journey to refresh. 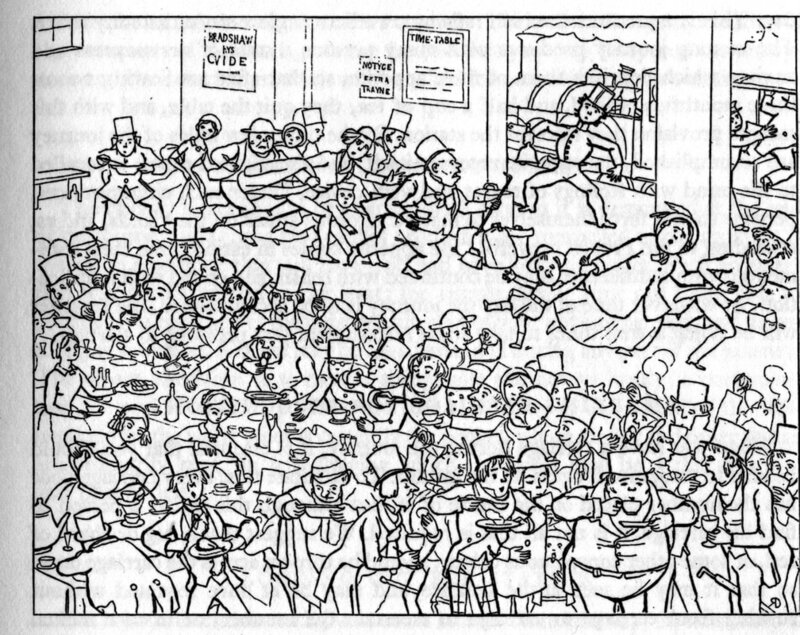 The refreshment establishment at Wolverton is composed of a matron or generalissima; seven very young ladies to wait upon the passengers; four men and three boys; one man cook, his kitchen maid and his two scullery maids; two housemaids; one baker and one baker’s boy; one garden boy and an odd man. … But the bell is violently calling the passengers to Come, come away! – and as they have all paid their fares and as the engine is loudly hissing, they soon, like swallows of summer, congregate together and fly away. …And, we regret to add, 666 bottles of gin, 464 bottles of rum, 2,392 bottles of brandy! Image (unknown artist) and primary source material from LAMK archive.